The bisbenzylisoquinoline alkaloids – a tabular review (P. L. Schiff, Jr.). Alkaloids from Malaysian flora (Toh-Seok Kam). Applications of palladium chemistry to the total syntheses of naturally occurring indole alkaloids (Jie Jack Li). Subject index. Organism index. 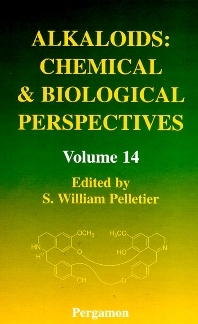 Volume 14 of this series presents three interesting reviews of research on alkaloids. Chapter 1, by Paul L. Schiff, Jr., is a monumental effort, presenting a selective, comprehensive tabular review of research on the bisbenzylisoquinoline alkaloids, with an analysis of the respective alkaloid types. The chapter should serve as a very useful tool for the bench research scientist who is involved in the isolation and elucidation of structures of bisbenzylisoquinoline alkaloids. Moreover, the data in these tables provides the botanical distribution and occurrence (family, genus, species) of the various classes of these alkaloids. The alkaloids are also categorized by their molecular weights and structural types. Chapter 2, by Toh-Seok Kam, is a review of alkaloids derived from Malaysian flora. Malaysia's position near the Equator confers on it a tropical climate characterized by high temperatures, humidity, and rainfall, conditions favorable for plant life that has resulted in a rich flora of about 15,000 species of higher plants. This review concentrates on work published during the past twenty years and where appropriate compares the occurrence of alkaloids with studies of similar plants from countries neighboring to Malaysia, especially Thailand and Indonesia. Chapter 3, by Jie Jack Li, presents a collection of very interesting total syntheses of naturally occurring indole alkaloids where palladium chemistry plays a central role in the syntheses. Five different types of palladium-mediated reactions are treated: (1) oxidative cyclization reactions promoted by palladium (II) species; (2) transmetallation reactions with organoboranes, organostannanes, and organozinc reagents; (3) inter- and intramolecular Heck reactions; (4) reactions with &pgr;-allylpalladium as the intermediate; and (5) reactions using C-N bond formation as the key step for the synthesis.